Job Seekers - Find a job that fits! Work shouldn’t be drudgery. It should use your skills, abilities and talents. It should put a smile on your face! We will sit down and find out what you want to do. We take the time to match your skills and talent with opportunities with our customers. Employers - Put us to work! Selectemp delivers reliable people who are ready to work. 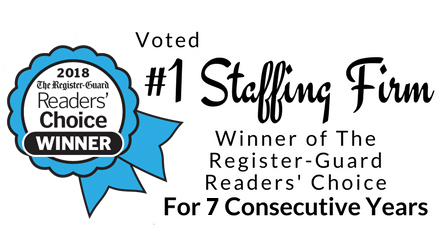 We carefully match your staffing needs with highly qualified contract employees. Our entire team will focus on finding people who will get the job done for you. We represent great employers and hire only the best candidates. We also draw on the resources of our other Oregon offices to find the best candidate, or job, for your needs. All candidates go through a rigorous, in-depth screening process before we agree to represent them - and we make regular contact with our employees once they start working. Selectemp provides companies with well-trained, reliable employees at a reasonable cost. Our vision has always been to make people happy by matching them with jobs that unlock their potential. Visit our Employee Web Center to login and manage your Selectemp account and profile.